Outside rope border cut out. 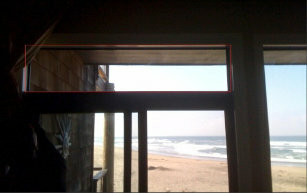 Phil contacted me about building a nautical transom for his beach condo in Pelican Point at Pajaro Dunes, California. He sent a picture of where he wanted to install the transom (below), so I would better understand. From my website, he told me he liked both Mary's Sailboat and Jean's Sailboat ...with some changes. Then came the real surprise! Phil sent me a mockup where he had taken a photo of Jean's Sailboat, added 2 more pelicans, and added the mariner's compass from Mary's Sailboat. Phil's graphic example of what he wanted made it so easy for me that ....."even a caveman could do it". All I had to do was redraw it longer to fit Phil's opening. What a great location for a nautical transom? Phil asked me to send pictures along the way as he was documenting this adventure, so below are a few "under construction" pictures. Phil was enjoyable to work with, knew exactly what he wanted and I think really enjoyed the design process. 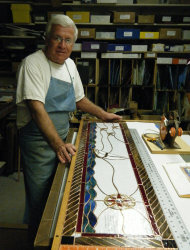 His transom measures 56 3/8 x 13 1/8, contains 233 pieces of glass and was finished in April, 2010. 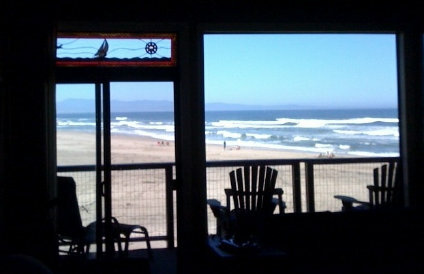 It now overlooks the Pacific Ocean in Pelican Point at Pajaro Dunes, California.